For about two centuries, somewhere between the Atlantic and Pacific Ocean, stretched a line moving westbound at a rate of 50 to 100 miles per generation. It was known as the “Frontier”, an explosive powder mix of guns, recent immigrants, Native Indians, European explorers, pioneers and early Spaniard settlers. Whether these rugged men adapted to the Land, fought their way West, traded, enforced or dodged the Law, preached new religions… none of them would remain the same after their experience on the Frontier of this wild territory they now had to share. This previously occupied Land, we now call the United States of America, would also never be the same. The Men of the Frontier eventually reached California and by the late 19th century America had, what felt like, as rich of a History and as diverse of a cultural background as the Old World had. The “Frontier Thesis”, written in 1893 by F.J. Turner, and later to become a controversial text, elaborated on the fact that “American identity occurred precisely at the juncture between the civilization of settlement and the savagery of wilderness”. As every generation moved further West, each member became more American, severing from its European roots of the East. Focusing on a style perspective by studying period photographs (as often, reality is stranger than fiction, as seen in some of the shots above), one can see an eclectic mix of imported fancy fabrics (in what could be imagined as bold colors), homespun local textiles, indigoes, calicoes… With the need for sturdy and practical garments, designs from traditional European gentlemen’ tailoring were adapted and modified. Rules were broken and new patents applied for. 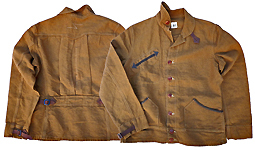 By the early 1900’s, sack coats were replacing tail coats; ‘ditto suits’ found more practical and affordable than dandy garb; canvas and denim chosen over moleskine, it’s European counterpart, as the workwear fabric of choice; bright calico printed cotton fabrics favored by native Indians facing the inevitable integration and bartered from the white man’s Trading Post; fringes on buckskin jacket sleeves added as an easy way to fence off flies when riding horses… and so on. 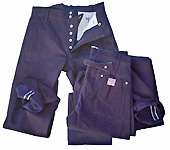 All that contributing to the creation of a new “American Style”, with elements still very well present today. 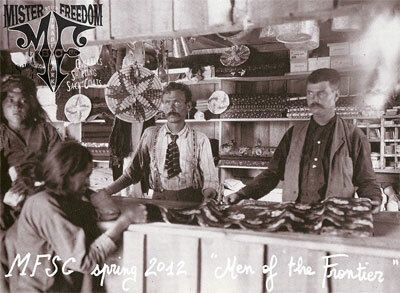 It is through digging those roots that Mister Freedom® new collaboration with Sugar Cane Co found inspiration for the “MEN of THE FRONTIER” MFSC Spring 2012 Collection. 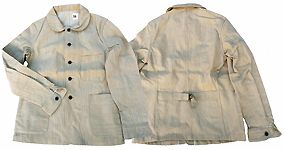 The resulting garments are not replicas, not Tom Mix recreated outfits, not Santa Fe tourist T-shirts, but a combination of imported European fabric styles and detailing, adapted patterns and silhouettes from the late 1800’s up to the 1930’s. 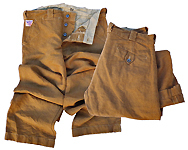 Although inspired by the early American Frontier days, we stayed away from the Hollywood clichés of the “Cowboys and Indians”, as interpreted by early movie studio costumers. 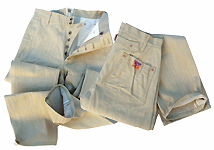 Instead, freely incorporating American/Native Indian/Mexican/European elements, we milled original fabrics and designed garments that could plausibly have existed, but stay our own humble addition to today’s attires for discerning gents. 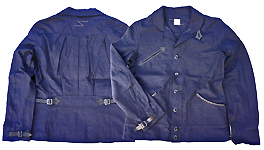 * The “Blouse Chaparral”, “Britches Chaparral” and “Range Vest”: Indigo and duck cotton linen canvas. 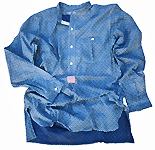 * The “Prairie Shirt”: Indigo selvedge light denim and madder calico printed cotton. 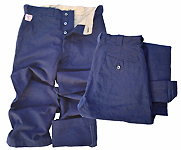 * The “Gun Slinger Jumper” and “Gun Slinger Pantaloons”: Indigo and Sand color selvedge denim twill. 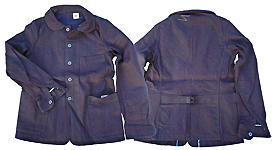 * The “Trade Shirt”: Two Indigo calico discharge prints, “Apache” and “Pueblo”.